I am a big fan of Indian food and have been lucky enough to eat at both Gymkhana and The Cinnamon Club (both of which have been awarded Michelin stars) and I’m happy to say that I think the cooking at Gunpowder is up to that high standard! Gunpowder is a tiny, almost cramped, restaurant in Spitalfields so I can’t compare in terms of opulence, space and service to those more illustrious places, but the food! Oh my, the food! It is delicious. Incredible. Stunning. Add in any other superlative you want and I’ll say yes! The wild rabbit pulao. The soft shell crab! The chargrilled chicken. The chittinad pulled duck. The fried okra. All are wonderful. And the Kashmiri lamb chops are easily up there alongside Tayyabs as some of the best lamp chops in London – and I can seriously give no higher praise than that. 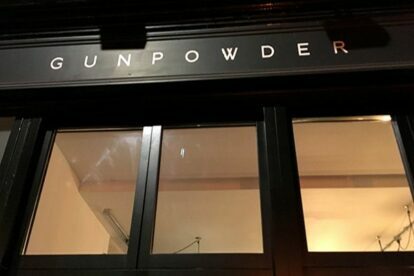 The team at Gunpowder will definitely move onto a bigger and more prestigious venue somewhere so get them while they are still small. And small they are. There is a no reservation policy (unless you are a table of six or more) but they are quite helpful about the wait time and ‘if we are full when you arrive we will text you when your table is ready’. We nipped to the local pub and waited 25 minutes for a table and I am so thankful we did. You will be too. Offline London tips? Get our iPhone / Android app!